When the Wymeswold Memorial Hall Committee applied for planning permission to create the extension and car park, one of the conditions was that they would pay for a professional archaeologist to be present when the access road to the car park was excavated. This is known to archaeologists as a 'watching brief', as they can only record and photograph what is revealed by the builder's activities – so none of the 'geophys' and trial trenches of Time Team. The site was intriguing, as it is on the edge of the historic core of village and cut through the medieval street frontage. The oldest Ordnance Survey maps show that there were no buildings there in the 1830s. But had older one simply gone by then? Sophie Clarke of University of Leicester Archaeological Services (ULAS) was the archaeologist who did the 'watching brief' in the first two weeks of February 2000. Her report was kindly made available to the Wolds Historical Organisation by Patrick Clay of ULAS; Patrick also kindly made arrangements for me to photograph all artefacts discovered. The nature of such a watching brief means that the ephemeral structural remains left in the ground by low-status medieval buildings were not revealed. However Ms Clarke was able to identify 22 well-preserved 'features' from the medieval era, including boundary ditches, gullies, pits and a pebble surface. The metalwork finds – two parts of a metal clasp plus the ?Roman coin. 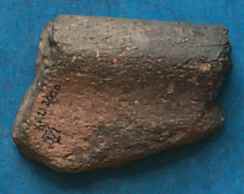 The 9th or 10th century pottry rim fragment – the oldest evidence for people living in the village of Wymeswold. Photographs by Bob Trubshaw taken with the kind cooperation of University of Leicester Archaeological Services. Although the soil was removed from the site immediately, 25 sherds of pottery were recovered. These show that there was domestic activity here starting in the 9th or 10th centuries, continuing to the 14th century. The earliest pottery is presumably of local production. One sherd is of Stamford ware (dating from the early 12th century) but the rest is mostly from Nottingham, with a few sherds possibly from Derbyshire. Some animal bone was found (including cow and sheep) and some small corroded iron objects, including a nail. A highly-abraded copper alloy coin may have been Roman. The best find was a 'folded strap clasp' of a style used from the 12th to mid-15th centuries, made from thin copper alloy sheet. So, although any direct evidence for medieval houses was not revealed, the pottery and other artefacts show clearly that Wymeswoldians were living on this site for about 500 years. Originally published in WHO Newsletter 2001.